I’m slowly getting back on board with everything. Thanks to everyone for all your kind comments, emails, notes, etc. I truly appreciate your sentiments. My lovely friend Alicia is home from New York for two weeks, so I hope to be catching up with her heaps. Her little Kyan has grown SO much in the past six months. I couldn’t wait to give Kyan and Alicia a huge hug (or six) each. Easter long weekend was perfect. My family came to lunch and Sunday, then we went to John’s family for dinner. The kids were all so good and we all enjoyed ourselves. I’ll leave you with a quick digi layout I created yesterday. 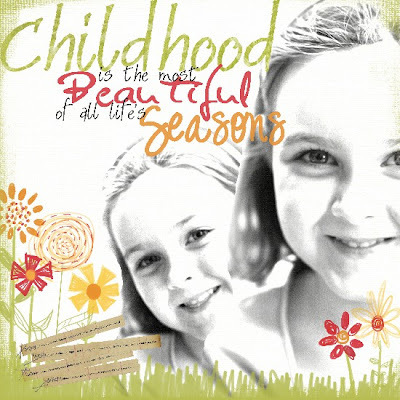 Childhood: Playful Spring kit from Scrap Artist; Brush by Sassi Designs; Fonts – Sandals, Glider Girls, Digs my Hart. ~ I love these photos of Amelia. She is very sweet.